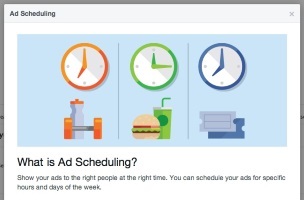 Facebook quietly added a huge new feature to its Power Editor, giving advertisers who use lifetime budgets the ability to schedule hours during which their ads should or should not run. Readers Abs Elmaz of Social House Media, Wilco de Kreij and Or Fialkov of Fialkov Digital alerted Inside Facebook about the new feature and shared the screenshots featured in this post. The video below is from de Kreij. Advertisers: How will you take advantage of ad scheduling on Power Editor?